“You don’t know what you have until you know what you have,” said someone, probably at least once. But when it comes to your website, it’s the truth – do you know every piece of content currently on your site? Do you know if its up-to-date? Do you know if the author even works at your company anymore? Is it optimized? Is it high-demand content worth keeping during a redesign? Is it even up to your newest editorial standards? A content inventory is the first step to answering all of those questions and more. Whether performed manually with an excel spreadsheet (one web administrator told us it took an entire year to complete their content inventory) or completed by an automation tool, a content inventory allows you to see every single piece of content living on your website. Read on to learn how creating a content inventory can make a website redesign more efficient, support your SEO strategy, and streamline website decisions. A website redesign is when most people start a content inventory, but already having inventoried content on-hand makes the decision process much smoother. If you already know where each piece of content lives on your site, you can easily map out where that content will transfer on the new site, or which content pieces need to undergo a content audit before going live. For example, if stakeholders suggest a page on the new site featuring articles on digital accessibility cases with large banks, you’ll be able to go straight to your content inventory list and pull all potential articles for the page. Without a content inventory, you could spend hours going through your site for where you think the articles might live, trying to use internal search to narrow them down by topic, emailing your staff hoping they’ve been archived by category somewhere, or wondering if the articles you do find are the most recent version or not. As someone who creates content for a living, welcome to my worst nightmare. Whether you’re overhauling your entire search strategy or looking to bump up in the result listings for specific long-tail keywords, your content inventory can be your greatest SEO resource. A content inventory can include a wide variety of data – the author, permanent file location, and format, but also important SEO categories like meta descriptions, page titles, and target keywords. It’s up to you how specific you want your content inventory to be, but in this case, the smallest details can save the biggest amount of time. By including SEO data in your content inventory, you’ll know at first glance which content already includes those long-tail keywords, which needs to be updated, and which needs to be rewritten and optimized to support new SEO goals. Again, I want to draw the line between content inventory and content audit. A content inventory is a quantitative review of all content assets on the site including text, images, multimedia files, and more. A content audit is then the in-depth review of each asset within your content inventory. quality of your content like a content audit, it will show any gaps in your overall content strategy. Are you actually producing content on the topics you’ve identified as important for your audience? Are those pieces still garnering traffic? As you look at your content inventory list, do you notice any glaring holes or missing landing pages for downloadable pieces? Do all of your pieces include optimized meta descriptions and titles? Unlike evaluating content quality, these questions aren’t subjective – either you are, are you aren’t. You do or you don’t. A content inventory should reflect your content strategy. It should show that you’re producing content on topics that matter to your target audience. It can also serve as a blueprint for taking your strategy to the next level. Content inventories provide an easy segue into conversations with stakeholders – if you’re not being given budget to produce content your visitors care about, then that content won’t exist on your inventory. Next time someone asks, “Well, aren’t we doing that?” you can direct them to your content inventory. 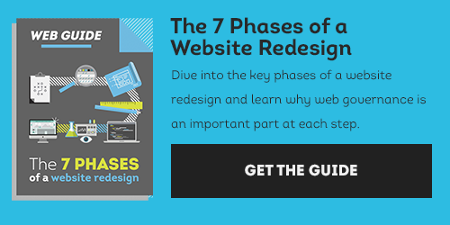 the 7 Phases of a Website Redesign.